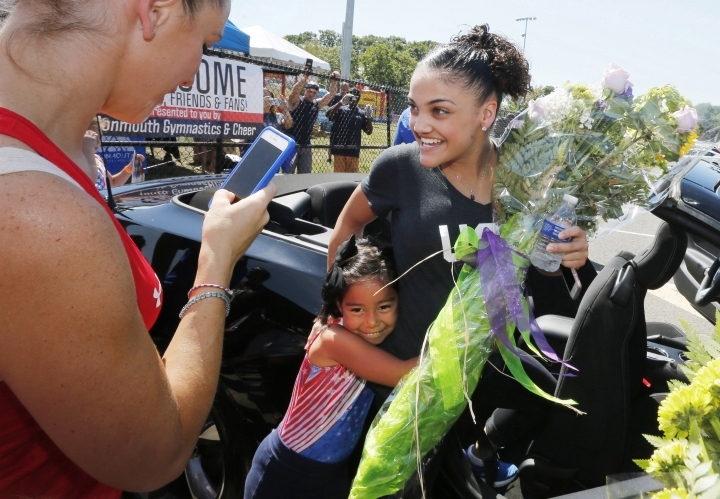 Thousands of people turned out to welcome gymnasts Aly Raisman and Laurie Hernandez back to their hometowns Saturday after they wowed the judges in the Summer Olympics in Rio de Janeiro. The two were on the gold-medal winning U.S. women's gymnastics team, dubbed "The Final Five," and also won individual medals. In the Boston suburb of Needham, Massachusetts, a "Rally for Aly" was held for 22-year-old Raisman, who also won silver medals in the floor exercise and the individual all-around. Raisman arrived at the rally atop a fire truck and on Friday she threw out the first pitch at Fenway Park before the Red Sox game. The town also hosted a parade and rally for her when she returned from the 2012 Olympic games in London with two gold medals and a bronze medal. In New Jersey, residents of Old Bridge staged an elaborate ceremony Saturday to honor Hernandez's accomplishments. In addition to the team medal, she won an individual silver medal in the balance beam competition. The 16-year-old took part in a motorcade that featured police, military members and gymnastics groups. The event culminated with a ceremony at a school football field where residents packed the bleachers, many cheering and holding signs praising Hernandez's efforts.